Brickbashing games never get old, it seems. 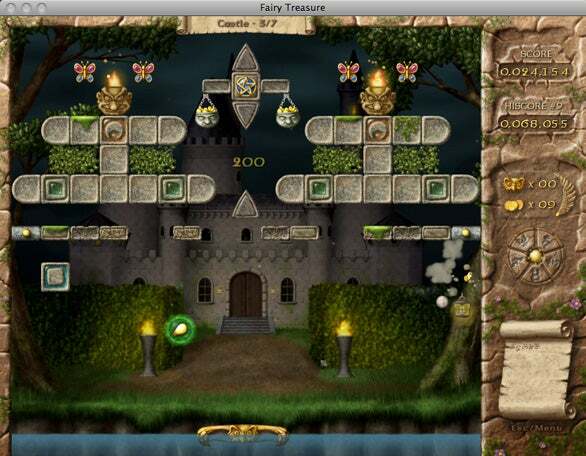 PC game maker GameOn knew this when it created Fairy Treasure, which is now on the Mac thanks to the efforts of Red Marble Games. Fairy Treasure surrounds the basic Breakout concept with a fantasy story set in the land of Trollandia. An evil, greedy troll has stolen treasure from the kingdom and it’s your job to recover it. To do so, you must travel along the Fairy River in your magic raft, coming up against nasty creatures of folklore like hags, goblins and such. You’ll gather magic scrolls to find hidden treasures, unlock secret areas and collect keys. The basic gameplay is the same as other brickbashing games: You move a paddle horizontally across the bottom of the screen. You have balls that bounce upward, rebounding either against the perimeter of the game area or against bricks and other objects that take up space. Each level sports a different design that may requires a different strategy to knock the bricks down—it’s not always just as simple as catching the ball as it rebounds, as the bricks will unlock a number of bonuses really quickly, and you have to catch many of them to reap the rewards. Breakout-style games have come a long way since the Atari 2600, as evidenced by the colorful graphics and animation in Fairy Treasure. Fairy Treasure sports the usual accouterments of a casual game—the ability to retain a player profile, and automatically save when you quit, so you can return to where you left off when you come back to it. (The latter feature is particularly useful for making sure that playing a round or two on breaks or lunch doesn’t cut into actual productivity at work.) You have the option of full-screen play or windowed mode—again, useful if you want to keep track of other things like incoming mail while you’re playing the game. Fairy Treasure also sports one bad habit that I dislike: When it first launches it defaults to full-screen mode, and it will rearrange your windows accordingly. I was exceedingly irritated when I exited the game only to find that the windows I’d left open—Mail, Safari and a few others—had all be automatically resized to fit the tiny dimensions of the game’s full-screen resolution. Changing the game to Windowed mode cures it of this bad habit, but it’s something to remember the first time you launch Fairy Treasure. The game runs natively on both PowerPC- and Intel-based Macs running OS X 10.3.9 and higher. You can download a playable demo before you plunk down $20 ($25 for the CD version). Fairy Treasure is a good example of what brickbashing games have evolved into in the 21st Century. They’ve come a long way from Breakout on the Atari 2600, and it’s for the better: Fairy Treasure is fun, engaging and challenging. It’s not for everyone—the whole story of Trollandia may come off as a bit flighty to some, perhaps even distracting from the game play—but really, it doesn’t get in the way.